Some films are made by a single performance from a great actor, and Harry Brown is such a film. The title role is played by Sir Michael Caine, who brings flesh and blood to what otherwise might’ve been a paper-thin role. Combining the hard-boiled qualities from his early years with his more recent vulnerable fatherly authority, Caine gives a performance that is both coarse and affecting. 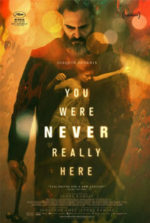 First-time feature director Daniel Barber makes a leap from television commercials to cinema by embracing the familiar Death Wish formula of vigilantism movies. And with Caine leading his picture, Barber’s debut proves to be more than an exploitative picture about revenge; but instead, it’s a startling look at social problems that have no satisfying solution. Caine plays pensioner Harry Brown, a recent widower who ignores the violence around him in his dilapidated London housing estate. Nearby, youth gangs sell drugs and weapons and assault anyone that gets in their way—even those that don’t get in their way. In the first scenes of senseless violence, a gang member’s initiation involves randomly shooting a mother walking her baby in a stroller. To this sort of act, Harry Brown normally turns his head, until his chess buddy and sole friend, Leonard (David Bradley), is beaten and stabbed to death by these young hoods. The police offer no help. 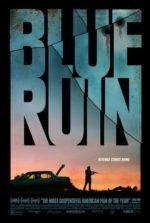 So Brown, a former member of the Royal Marines, takes matters into his own hands, finds himself a gun, and tries to avenge his friend. What other option does he have? The IRA he battled so long ago fought for a purpose, yet these gangs respect nothing. 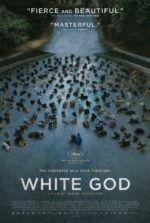 Emily Mortimer plays Detective Inspector Alice Frampton, but she also serves as the film’s social conscience. Barber must be aware that vigilantism poses certain moral implications, that violence begets violence. This is summed up rather nicely when the police raid the estate, hoping to clear out the criminal element, and the population retaliates with a riot that quickly overcomes the authorities. And Frampton is there at precisely the right moment to ask Brown, “Where does it end?” Unlike many vigilantism films that provide catharsis, Barber’s picture lacks that relief we usually feel when the bad guys receive their comeuppance. Brown isn’t there to take down the criminal element once and for all; he hasn’t set his sights on the tip-top crimelord, who once dead will mark the end of all criminality in London. Rather, Brown merely relieves the world of some very bad people. Once they’re gone, however, others will inevitably take their place. 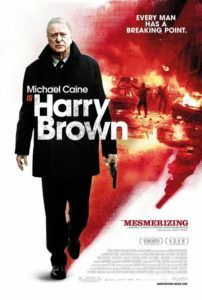 Michael Caine makes Harry Brown an excellent performance by being Michael Caine. At 77, the actor’s face, with those intense eyes, has a way of confirming that he’s the wisest, most experienced, and certainly the most commanding presence onscreen. It’s his gift. In a way, the actor returns to the type of role he used to do back in the 1960s and 1970s with Get Carter and The Italian Job. But here that action star has been weathered by time, and both the film and Caine are willing to admit as much. Barber doesn’t pretend that Brown will be able to chase down his targets in hot pursuit; rather, Caine slows and stumbles over into an emphysema-induced blackout. It’s that kind of realism that makes Caine’s role more than just a one-dimensional revenge-seeker. Despite several scenes involving shootouts and brutal violence, Harry Brown never resorts to cheap thrills for the sake of entertainment value. Caine’s performance and the thoughtful script by Gary Young (2009’s The Tournament) deepen material that’s usually twisted into action fodder. Audiences will be reminded of Clint Eastwood’s performance in Gran Torino, in that both films feature former action heroes-turned-elders faced with the threat of violent gangs. However, Eastwood ended his film without the need for a hero with a gun, whereas Caine’s character isn’t afraid to pull the trigger. Though Barber’s film proves grittier, the message is just as clear, and the central performance is just as affecting.